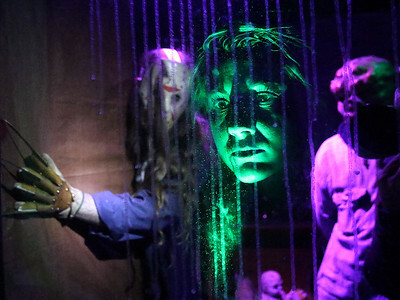 Matthew Apgar - mapgar@shawmedia.com Tristin Micek of Barrington Hills, center, is lit in green on the opposite side of a bloody one-way mirror as Matt Bishop, left, and Christian Hanssler, both of Algonquin are seen in the reflection at The Keep Haunted House on Thursday, Oct. 15, 2015 at Tee 2 Indoor Golf in Huntley. 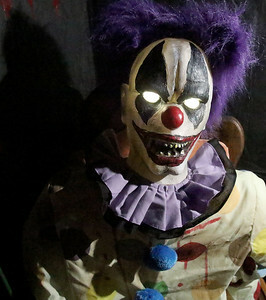 The haunted house will be opened through Sunday, Oct. 31. 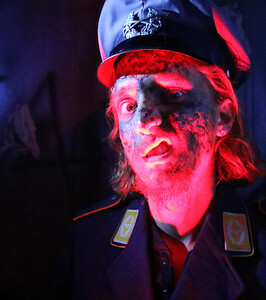 Matthew Apgar - mapgar@shawmedia.com Jake Szwaglis of Algonquin poses as a nazi zombie at The Keep Haunted House on Thursday, Oct. 15, 2015 at Tee 2 Indoor Golf in Huntley. 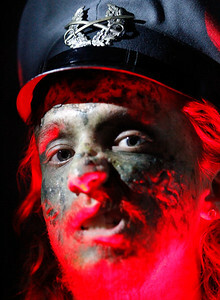 The haunted house will be opened through Sunday, Oct. 31. 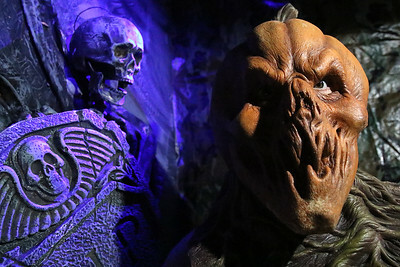 Matthew Apgar - mapgar@shawmedia.com Creepy decorations abound at The Keep Haunted House on Thursday, Oct. 15, 2015 at Tee 2 Indoor Golf in Huntley. 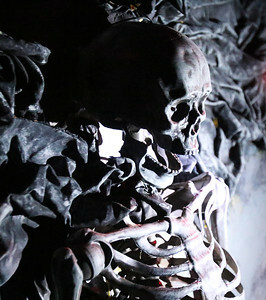 The haunted house will be opened through Sunday, Oct. 31. 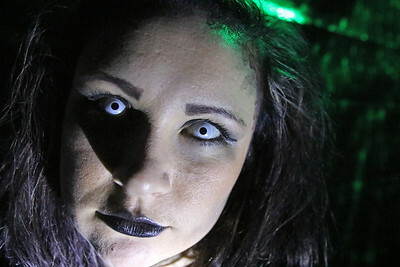 Matthew Apgar - mapgar@shawmedia.com Mia Purcell of Barrington poses as the Spider Queen at The Keep Haunted House on Thursday, Oct. 15, 2015 at Tee 2 Indoor Golf in Huntley. 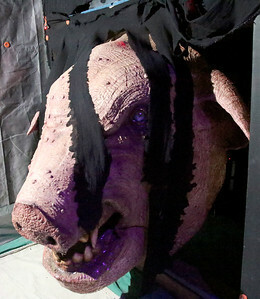 The haunted house will be opened through Sunday, Oct. 31. 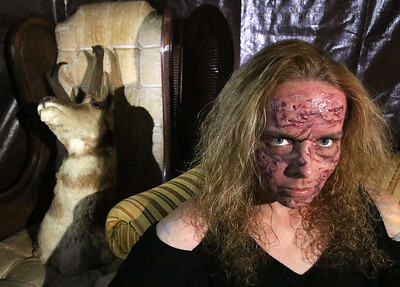 Matthew Apgar - mapgar@shawmedia.com Katie Hill of Wonder Lake poses for a photo dressed as a burn victim at The Keep Haunted House on Thursday, Oct. 15, 2015 at Tee 2 Indoor Golf in Huntley. 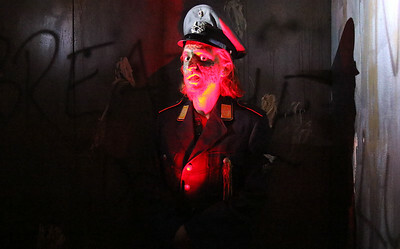 The haunted house will be opened through Sunday, Oct. 31. Matthew Apgar - mapgar@shawmedia.com Gene Provenzano of Crystal Lake is ready to frighten as the steampunk butcher at The Keep Haunted House on Thursday, Oct. 15, 2015 at Tee 2 Indoor Golf in Huntley. 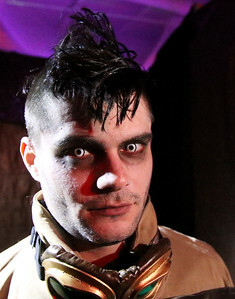 The haunted house will be opened through Sunday, Oct. 31. Matthew Apgar - mapgar@shawmedia.com Joe Lee of Elgin is ready to make people scream in costume as an evil pumpkin at The Keep Haunted House on Thursday, Oct. 15, 2015 at Tee 2 Indoor Golf in Huntley. The haunted house will be opened through Sunday, Oct. 31. 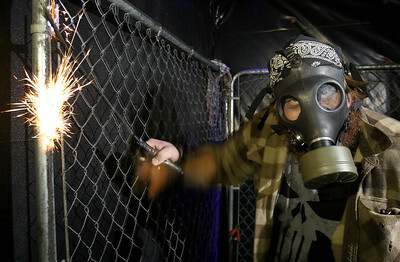 Matthew Apgar - mapgar@shawmedia.com Mike Kucek of West Dundee ignites sparks and incites terror at The Keep Haunted House on Thursday, Oct. 15, 2015 at Tee 2 Indoor Golf in Huntley. The haunted house will be opened through Sunday, Oct. 31. Mia Purcell of Barrington poses as the Spider Queen at The Keep Haunted House on Thursday, Oct. 15, 2015 at Tee 2 Indoor Golf in Huntley. 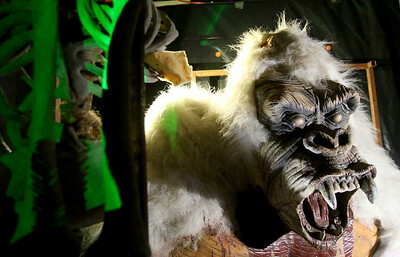 The haunted house will be opened through Sunday, Oct. 31.